One of EBC’s annual activities is to hold an outreach event for Members of the European Parliament and the general public during the Brain Awareness Week (BAW). This global campaign is held in March every year and aims to increase public awareness on the progress and benefits of brain research. 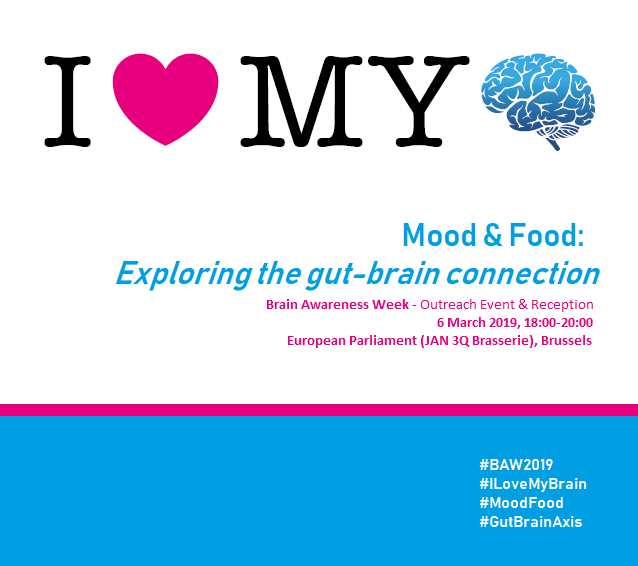 This year we focus on “Mood and Food: Exploring the gut-brain connection”. Join us in the European Parliament in Brussels (JAN 3Q Brasserie) on the 6th of March from 18:00 to 20:00. This Brain Awareness Week event will focus on the connection between mood and food, exploring the relationship between what you eat and how it can affect your mood and daily function. Held as a reception this year, the event will combine food, informal presentations and discussion with experts in this growing field of research. This event is kindly hosted by MEPs Marian Harkin (ALDE, IE) and Jose Inacio Faria (EPP, PT) and held in partnership with the European Dana Alliance for the Brain (EDAB) and the Federation of European Neuroscience Societies (FENS). We look forward to welcoming our speakers, Dr. Alejandro Arias-Vasquez (New Brain Nutrition Project), Kimberley Wilson (Monumental Health, NHS Mental Health Trust Governor) and moderator Prof. Patrice Boyer (EBC Vice President). CLICK HERE to register your attendance!